The House of Representatives yesterday directed the Minister of Petroluem Resources, Dr Rilwanu Lukman, to ensure adequate fuel supply in the country within a week or be sacked. The House also threatened to sack Alhaji Sanusi Barkindo, the Group Managing Director, NNPC and the Managing Director of Petroleum Pricing Monitoring Committee (PPMC), Mr Stanley Lawson. The directive was sequel to the adoption of a motion of urgent public importance sponsored by Rep. Mayor Eze (PDP-Imo) on the incessant scarcity of petroleum products across the country. The lawmakers expressed displeasure at the inability of these agencies of government to curtail the scarcity which they noted, had persisted for more than three weeks and brought untold hardships to the citizens. Speaking on the motion, Eze said it was necessary for the Federal Government to intervene on the fuel scarcity and also implement the deregulation policy. import fuel if its refineries were working at full capacity. He expressed regret that Nigeria was not taking advantage of its membership of the Organization of Petroleum Exporting Counties (OPEC). 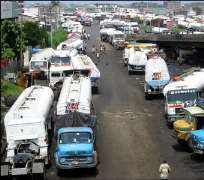 The lawmaker cited the existence of cartel and monopoly in the oil industry as some of the problems facing the sector. ``Cartel will want to exist, but that monopoly must be broken by government by letting our refineries work and also build new refineries,'' he said. Speaking in the same vein, Deputy Chairman, House Committee on Petroleum Resources, Rep. Aro Bamidele, also blamed the current fuel scarcity on the poor state of the refineries in the country. Bamidele said the nation currently consumed about 120 million litres per day whereas the refineries currently produce only 25 to 30 million litres daily, saying the solution to the problem was the building of additional refineries. In his contribution, Rep. Dino Melaye, (PDP-Kogi), observed that the fuel problem posed a great danger to the country if not quickly resolved. Melaye, the Chairman, House Committee on Information, urged the House to summon the affected government officials to explain their roles in the lingering fuel scarcity.